Identifying and treating older adults' nutrient deficiencies is essential to ensuring optimal quality of life. The world of genomic testing is allowing us to identify the particular genetic mutations that, when expressed, cause a deficiency. But this testing often is out of reach for many patients. It can be very expensive and frequently isn't covered by health plans. Yet most of the micronutrient deficiencies that negatively impact wellness can be treated at minimal cost. This is where the nutrition-focused physical exam (NFPE) excels. NFPE training is offered through the Academy of Nutrition and Dietetics at hands-on workshops. It's a process designed to detect malnutrition signs and symptoms starting with a general observation, followed by a head-to-toe examination that includes physical observations, functional indicator assessments, and a patient interview. When conducting an exam, an observation may provoke further questioning, or a response to a habit or history question may incite further inspection. The NFPE process focuses extensively on body composition (eg, muscle, fat stores, fluid accumulation/deficit) and changes that have occurred in these areas. However, this article will explore the micronutrient deficiency component in the geriatric population. Please allow me to share my journey. It was Mother's Day evening. I had just completed the NFPE training on the previous Friday, but I was excited and wanted to practice my new skills. I was particularly interested in assessing Anna, a newly admitted resident in a skilled nursing facility. She was nonverbal and didn't participate in functional tasks. I was unable to obtain a diet history or insight into previous habits. Typically I'd seek historical information from the family and close friends. However, she was admitted through Adult Protective Services, and no such information was available. As I assessed her for muscle and fat deficits, which were apparent, I also was attentive to signs of micronutrient deficiencies (see table online), especially vitamin B12, which, if deficient, could impact her cognitive function. Initially, I thought I could examine Anna physically, including her hair, skin, eyes, mouth (especially her tongue), and nails, and easily derive conclusions about her nutritional state, but soon I discovered that her participation was essential to identify the micronutrient deficiencies most common in the elderly. In a skilled long term care setting, had I found indicators, I would follow up with a request for biochemical data. But even without biochemical support, supplementation can be initiated safely for most micronutrients, as adverse side effects are minimal. This also may apply if lab testing is expensive in comparison with the cost of treatment or if the testing isn't reliable or is difficult to interpret, as the most recent research is suggesting with respect to vitamin D.
The heterogeneity of this group presents one of the greatest challenges in evaluating the geriatric population. Energy needs are lower than those of the younger population, yet many of the recommended micronutrient intakes may be comparable. A lifetime of different environmental exposures combined with an individual's potential polypharmacy play key roles in assessing for micronutrient deficiencies. The ability to obtain an accurate and comprehensive history often is key to identify nutrient concerns. Multiple studies of the elderly have found inadequacies in micronutrient intake. 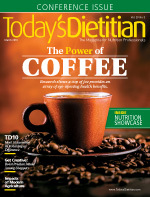 The most commonly identified were vitamin D, calcium, and folic acid.1,2 Studies also have included vitamin E, iodine, magnesium, vitamin B6, and vitamin C in deficiency findings.2-4 Chernoff concluded that in elderly women, vitamin B12, vitamin A, vitamin C, vitamin D, calcium, iron, and zinc are among the most significant micronutrient deficiencies.5 Some of the most common are examined below. Many studies have looked at 25-hydroxyvitamin D (25OHD) levels. A level of less than 20 ng/mL is defined as deficiency, whereas 25OHD at 20 ng/mL to 30 ng/mL is defined as insufficiency, although the actual recommended cutoff points vary by health institution.9,10 A meta-analysis found a direct cross-sectional and longitudinal association between lower 25OHD concentrations and falls, specifically with concentrations <20 ng/mL, although the authors suggested additional well-designed randomized controlled trials.11 Measurement of 25OHD has become more common in long term care communities, but the interpretation of results presents challenges. Results depend not only on intake but also on sun exposure (season and latitude) and whether genetic variations have been expressed in the metabolic pathway, making it difficult to compare levels over time when evaluating the efficacy of vitamin D therapy and the supplement dosage indicated. As with measurement of vitamin D, recommended therapy for correction of a deficiency varies from at least 1,000 IU per day of vitamin D3 (cholecalciferol) taken orally to the Endocrine Society Clinical Practice Guideline suggesting supplementation with 50,000 IU of vitamin D2 (ergocalciferol) or D3 once weekly for eight weeks (or 6,000 IU daily) to achieve a blood level >30 ng/mL, followed by maintenance therapy of 1,500 IU to 2,000 IU per day. Some studies suggest that vitamin D2 and D3 forms are equivalent at low doses but that D3 is more effective at high doses.12 Studies also have implied that higher supplementation may be needed as an individual's weight increases.7,12 For the general population, Adequate Intake of vitamin D in individuals aged 51 to 70 is established at 400 IU and increases to 600 IU for those over the age of 70. Before 1998, folate inadequacy was identified as a concern in a study that examined participants and nonparticipants in the Elderly Nutrition Program.15 As of 1998, the FDA has required folic acid fortification of a variety of grain products.4,7 This has had a positive impact on meeting folate needs in the older adult population. However, a study published in 2010 investigating the micronutrient intakes of older adults attending senior centers in Kansas found that more than 71.5% of participants continued to have dietary folate intake below the recommended level, and, of the study participants taking a folic acid supplement, more than 84% (ie, 25.9% of the study participants) exceeded the Tolerable Upper Intake Level within the Dietary Reference Intake model.4 Although concerns have been raised about the risk of accelerating preneoplastic lesions with high-dose synthetic folate supplementation, the primary concern relates to vitamin B12. Before folate therapy is started, vitamin B12 adequacy should be confirmed, as folate can mask vitamin B12 deficiency signs until irreversible nerve damage occurs. Vitamin B12 Deficiency: Is It Underdiagnosed? A possible simple early test was described by Karanth.19 In Karanth's test, the skin color tone is measured at the interphalangeal joint and the phalanx of the index finger. The person to be screened is taken to a natural light source and the Von Luschan skin tone chart is used to compare the difference between the color readings. The reported limitation is that the study population wasn't equally distributed in the six Fitzpatrick types and that it needs to be verified in a larger population. In a study of Dutch community-dwelling adults over the age of 65, dairy and meat were the most important contributors to serum vitamin B12 levels, followed by fish and shellfish. Milk intake was associated with the highest serum vitamin B12 concentrations, whereas egg intake didn't significantly contribute to higher serum vitamin B12 concentrations.22 Considering the results of this study, it's important to confirm that milk alternatives such as soy and almond are vitamin B12 fortified, as those that aren't fortified contain no vitamin B12. An additional bonus with fortified milk is that it contains a crystalline form of vitamin B12 that isn't negatively impacted by conditions that alter stomach pH and vitamin B12 availability. The crystalline form of vitamin B12 also is used in oral supplements. This article has examined some of the more common nutrient deficiencies. Nutrient deficiencies shouldn't be accepted as part of growing old. Each patient has his or her own unique biochemical composition and environmental exposure history. It should be a clinician's goal to optimize health as opposed to simply treating illness. Awareness on the part of dietitians and early identification and treatment of nutrient concerns is consistent with this approach. — Cora Martin, RDN, CSG, LD, is a registered dietitian nutritionist in Chardon, Ohio, and manages a dietetic consultation practice specializing in long term care communities. She's board certified in gerontological nutrition. Her mission is to bring integrative and functional nutrition to long term care communities, recognizing that strengthening assessment skills is an important first step. • Attend a nutrition-focused physical exam workshop through the Academy of Nutrition and Dietetics. • Read Nutrition Focused Physical Assessment: Making Clinical Connections by Mary D. Litchford, PhD, RD, LDN, and The Skin, Tongue and Nails Speak: Observational Signs of Nutritional Deficiencies by Donna Burka Wild. 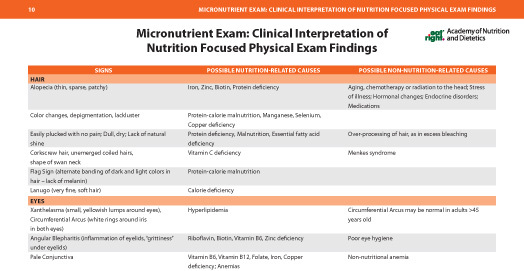 • Keep a copy of Nutrition Focused Physical Exam Pocket Guide, edited by Beth Mordarski, RDN, LD, and Jodi Wolff, MS, RDN, LD, CNSC, FAND, with you for reference. 1. Fabian E, Elmadfa I. Nutritional situation of the elderly in the European Union: data of the European Nutrition and Health Report (2004). Ann Nutr Metab. 2008;52(Suppl 1):57-61. 2. Foote JA, Giuliano AR, Harris RB. Older adults need guidance to meet nutritional recommendations. J Am Coll Nutr. 2000;19(5):628-640. 3. Fritz K, Elmadfa I. Quality of nutrition of elderly with different degrees of dependency: elderly living in private homes. Ann Nutr Metab. 2008;52(Suppl 1):47-50. 4. Weeden A, Remig V, Holcomb CA, Herald T, Baybutt R. Vitamin and mineral supplements have a nutritionally significant impact on micronutrient intakes of older adults attending senior centers. J Nutr Elder. 2010;29(2):241-254. 5. Chernoff R. Micronutrient requirements in older women. Am J Clin Nutr. 2005;81(5):1240S-1245S. 6. Caillet P, Jaglal SB, Laforest L, et al. Impact of vitamin D supplementation on health-care use in a 25-hydroxyvitamin D-tested population in France: a population-based descriptive cohort study. Public Health Nutr. 2015;18(3):554-561. 7. Montgomery SC, Streit SM, Beebe ML, Maxwell PJ IV. Micronutrient needs of the elderly. Nutr Clin Pract. 2014;29(4):435-444. 8. Sakalli H, Arslan D, Yucel AE. The effect of oral and parenteral vitamin D supplementation in the elderly: a prospective, double-blinded, randomized, placebo-controlled study. Rheumatol Int. 2012;32(8):2279-2283. 9. Weisshof R, Chermesh I. Micronutrient deficiencies in inflammatory bowel disease. Curr Opin Clin Nutr Metab Care. 2015;18(6):576-581. 10. Litchford, MD. Nutrition Focused Physical Assessment: Making Clinical Connections. Greensboro, NC: CASE Software & Books; 2012. 11. Annweiler C, Beauchet O. Questioning vitamin D status of elderly fallers and nonfallers: a meta-analysis to address a 'forgotten step.' J Intern Med. 2015;277(1):16-44. 12. Grädel L, Merker M, Mueller B, Schuetz P. Screening and treatment of vitamin D deficiency on hospital admission: is there a benefit for medical inpatients? Am J Med. 2016;129(1):116.e111-116.e134. 13. Institute of Medicine, Food and Nutrition Board. Dietary Reference Intakes for thiamin, riboflavin, niacin, vitamin B6, folate, vitamin B12, pantothenic acid, biotin, and choline. https://www.nal.usda.gov/sites/default/files/fnic_uploads/thiamin_full_report.pdf. Published 1998. 14. Eng C. A genetic test you don't need. Cleveland Clinic website. https://health.clevelandclinic.org/2013/09/a-genetic-test-you-dont-need. Updated September 27, 2013. Accessed June 24, 2017. 15. Millen BE, Ohls JC, Ponza M, McCool AC. The Elderly Nutrition Program: an effective national framework for preventive nutritional interventions. J Am Diet Assoc. 2002;102(2):234-240. 16. Couderc AL, Camalet J, Schneider S, et al. Cobalamin deficiency in the elderly: aetiology and management: a study of 125 patients in a geriatric hospital. J Nutr Health Aging. 2015;19(2):234-239. 17. Wong CW. Vitamin B12 deficiency in the elderly: is it worth screening? Hong Kong Med J. 2015;21(2):155-164. 18. Allen LH. How common is vitamin B-12 deficiency? Am J Clin Nutr. 2009;89(2):693S-696S. 19. Karanth VK, Karanth L, Karanth TK, Karanth SK, Bekur R. A novel screening tool (Karanth's test) for vitamin B12 deficiency: a pilot study. BMC Res Notes. 2015;8:778. 20. Wild DB. The Skin, Tongue and Nails Speak: Observational Signs of Nutritional Deficiencies. Loveland, CO: Unique Perspective Press; 2013. 21. Chernoff R. Geriatric Nutrition: The Health Professional's Handbook. 4th ed. Burlington, MA: Jones & Bartlett Learning; 2014:55-57, 317-318. 22. Brouwer-Brolsma EM, Dhonukshe-Rutten RA, van Wijngaarden JP, Zwaluw NL, Velde Nv, de Groot LC. Dietary sources of vitamin B-12 and their association with vitamin B-12 status markers in healthy older adults in the B-PROOF study. Nutrients. 2015;7(9):7781-7797. 23. Harrington DJ. Laboratory assessment of vitamin B12 status. J Clin Pathol. 2017;70(2):168-173.